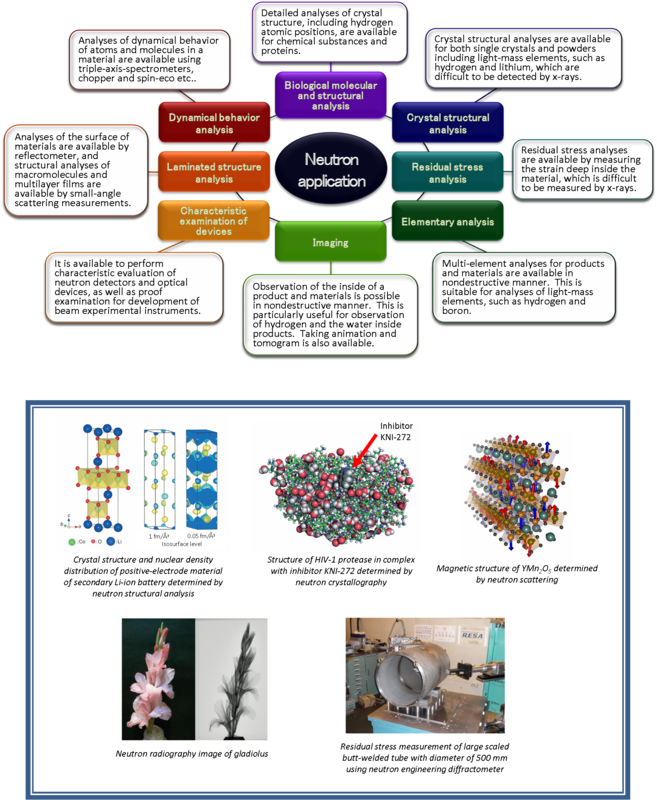 Unique properties of neutrons (such as high penetration, high sensitivity to light elements, possession of magnetic moment) make neutron scattering as a versatile probe to explore matter. A wavelength of neutron ranging from nano- to sub-micro meter is ideal to study structures of various states such as liquid, soft to hard matter including biological materials and thin-films, and to measure strains and textures in structural materials as well. Furthermore, another superiority of neutron scattering is its power to study dynamics in materials, such as thermal and diffusive motions, phonons and magnons etc. The neutron beam is also utilized for neutron radiography which is a nondestructive method to inspect the inside of materials, using the advantage that neutrons easily penetrate materials. The radiography image has sharp contrast between heavy element materials and hydrogen containing materials. Furthermore, neutron beam is used for elemental analysis by measuring prompt gamma-rays which are immediately emitted after neutron irradiation. Utilization of neutron beam at JRR-3 has been dedicated to various fields of researches and developments, including materials and life science, nondestructive analysis, materials engineering and neutron device development, in not only academia but also industry. Detailed descriptions of each research field are shown in the following figure.